In the last few weeks I have become totally addicted to Eclipse Mints. I always go for the peppermint flavour, spearmint is ok but has nowhere near the fresh almost painful minty tongue burn of the peppermint. Last week I made the error of buying the new orange flavour. For some reason I was convinced that it would be a minty orange taste and I found that very appealing. Mmm minty orange goodness! But alas, they just tasted much like vitamin C tablets. Bleargh. Surely they could have removed the word “mints” from the packet? It’s a little misleading. So now I’m on 50 mints a day at 5c a mint. Cheaper than smoking but not much. I fear I must quit the habit soon. I too went through a recent Eclipse addiction (mm, especially the cinnamon – like Smokers! ), and those little Extra sweets are delicious. HOWEVER, without wanting to lower the tone, they had a somewhat adverse affect on my stomach and bit thereunder. Mmm, I’ve cooled off with them since. Is that your photo Em it sure is spiffy! Anyway I thought you hated diet drinks…so how can you eat diet lollies? A? Martha, yes, I was worried about that too but haven’t noticed any ill effects. Guess I have cast iron bowels (that sounds painful). Karen, I have changed my position somewhat on phenylalanine since I learned that it is actually an essential amino acid used by the body to make protein and is all perfectly natural. Jury is still out on aspartame however, which is what usually creates the extra phenylalanine. I’m not sure what kind of sweetener is in Eclipse as it doesn’t even say on the packet – isn’t that illegal? I guess it can’t be phenylalanine – there are some people who have a genetic disorder called phenylketonuria who cannot eat it at all or they go crazy and die!! hence why it is always labelled as “contains Phenylketonurics” or whatever it is. I do hate diet drinks, however any residual sweetener aftertaste is burned away by the painful minty tongue scorch. Yum! I got into them because they contain that other Scandinavian sweetener, whose name eludes me at the moment… and no energy to look it up. Made of birch gum, and very good for the teeth. I mainly found my belly was just uncomfortable, but didn’t have too much effect on the bowels. You’ll all be pleased to know that in internet land. The thing I have been having a lot of is Coke Zero. I likes it. Must be genetic. I have 3 packs on my desk right now! Pepperint, cinnamon and spearmint. Has the “new” orange flavour come out in NZ yet? Its weird. First its like, mmmm so sweet, but that quickly turns to, “Oh, but so minty”… I seem to consume the peppermint ones fastest. I’m sure they are good for you. Where else do you get you daily requirement of phenylalanine? Not in fresh vegetables, thats for sure! 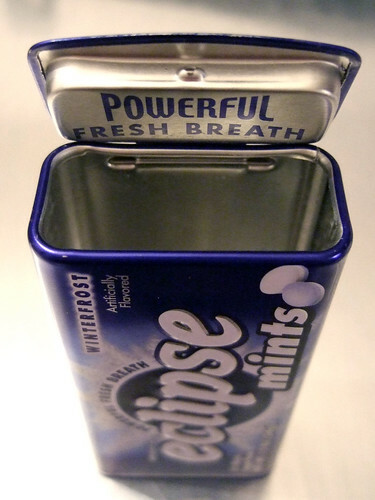 Eclipse mints are awesome but I get sick of the peppermint ones really easily. The cinnamon ones are best IMO. They bloat you up really badly though but its a small price to pay!